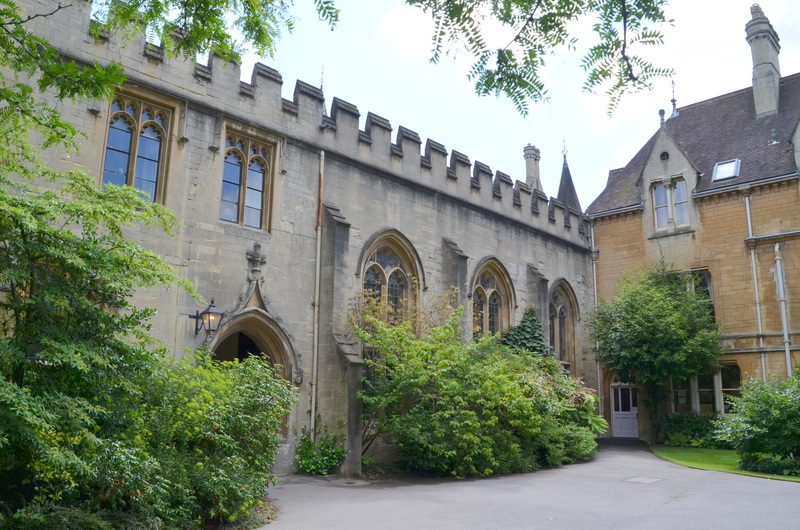 The Oxford Colleges ~ Balliol | The Happy Wonderer ~ ellen b.
I’m linking this post about one of the many Colleges in Oxford to ABC Wednesday. C is for Colleges. Thank you Denise Nesbitt and the ABC team. On Wednesday July 9th (Day 6 of our England Trip) we boarded a train in Moreton in Marsh to Oxford for the day. We found free parking on the street close to the station. The train ride was a short 37 minutes. 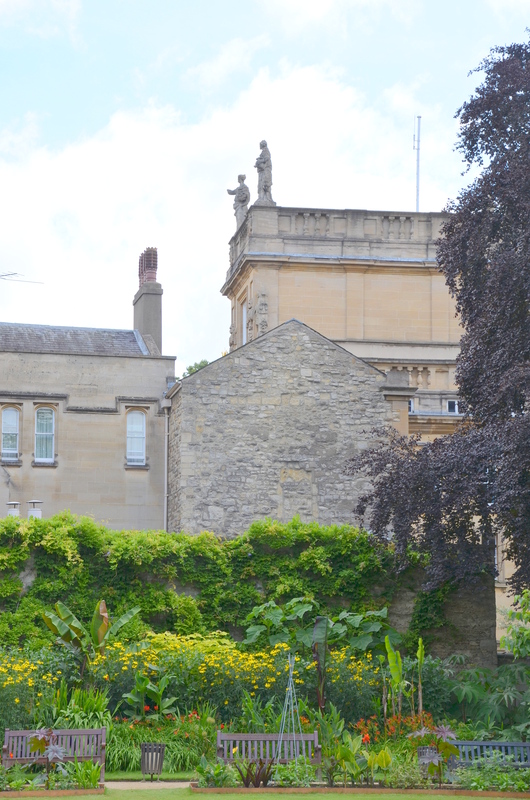 Since parking in Oxford is a challenge and you are advised to use park and rides on the outskirts of town we thought a train ride close to the center of town was the best option for us. We opted to go to the visitor center and sign up for a walking tour. There were a few other tour options but they seemed a little too hawkish for our taste. We only visited one of the colleges with the tour guide. 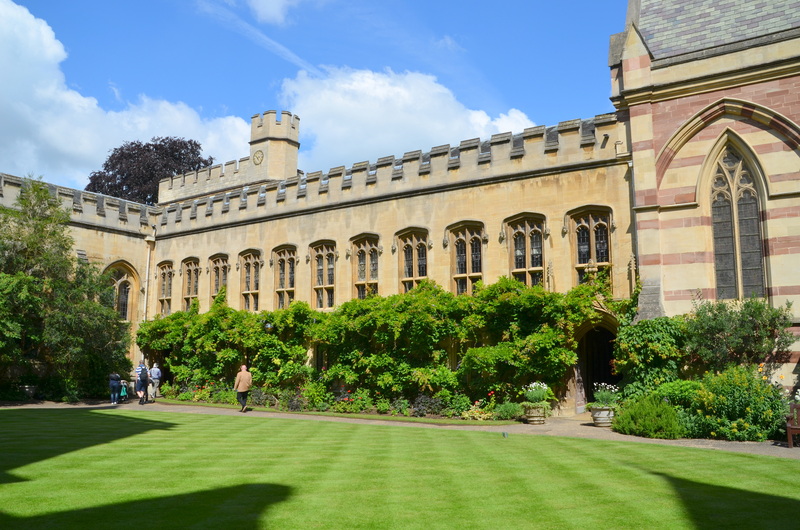 The oldest Oxford college continuously on one site, co-founded by a woman, Balliol is home to young people from many different backgrounds who have come to study with world-class academics. 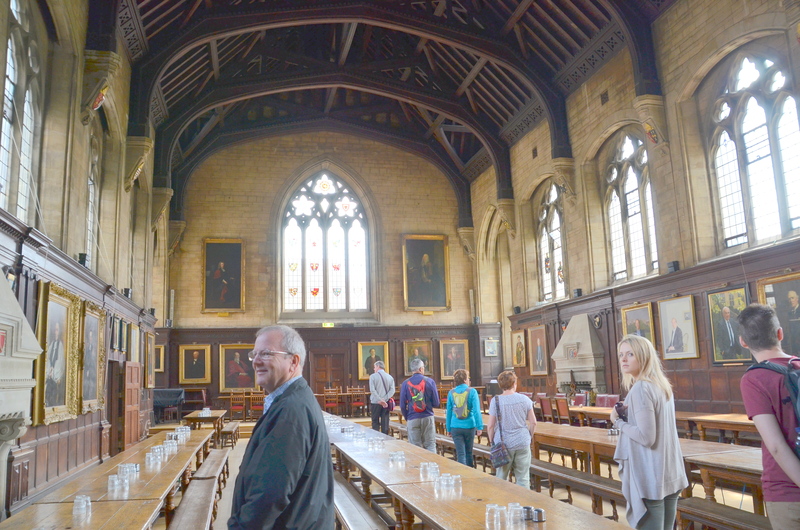 Each of the Oxford Colleges to my understanding have their own chapel, dining hall, libraries, and dormitories. 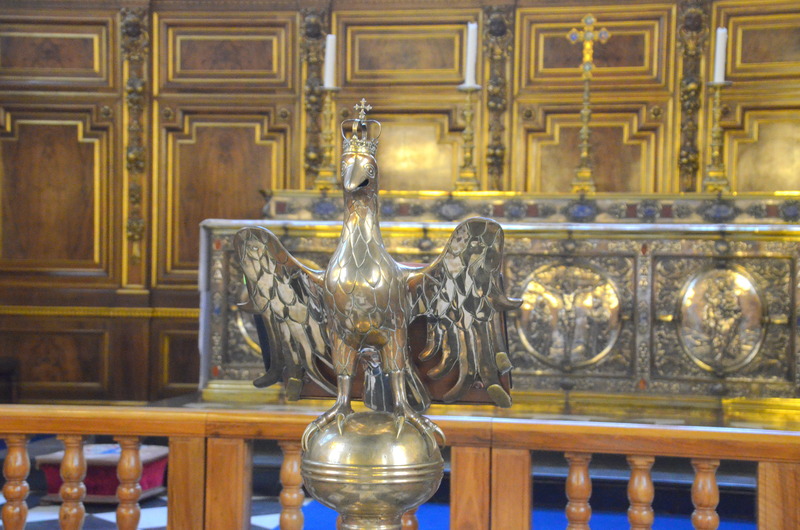 Some inside views of the William Butterfield chapel. 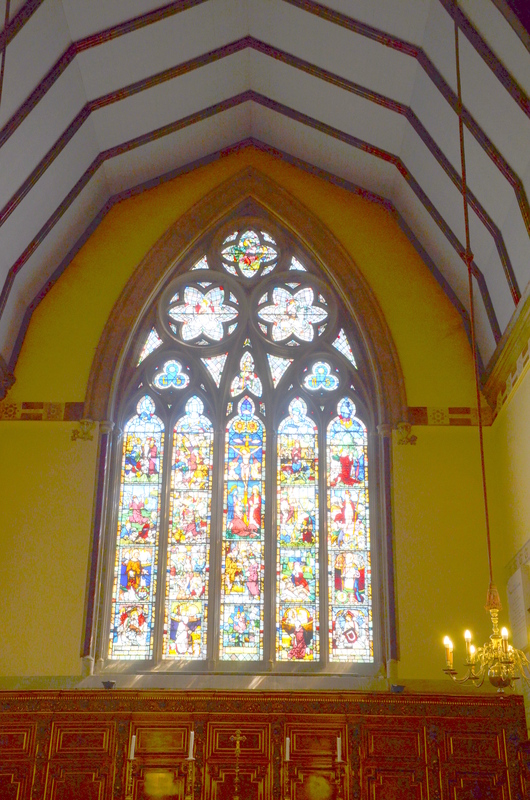 These are the outside views of the chapel designed by William Butterfield in 1857. 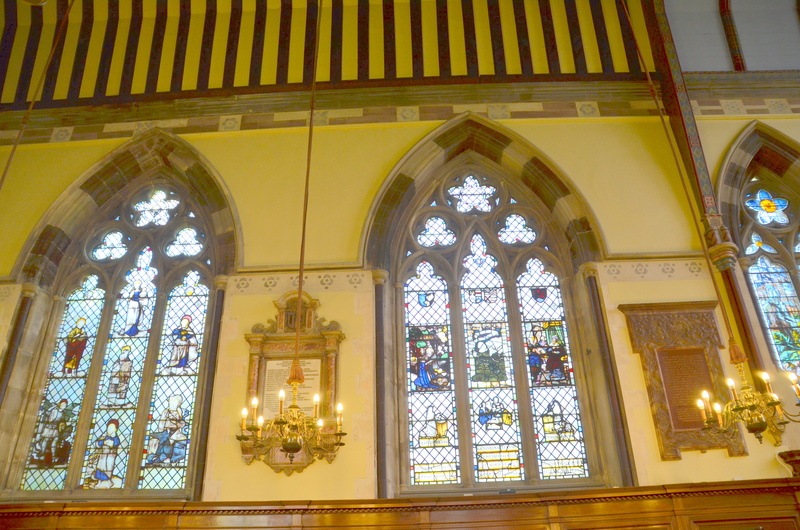 This was the dining hall for the college. 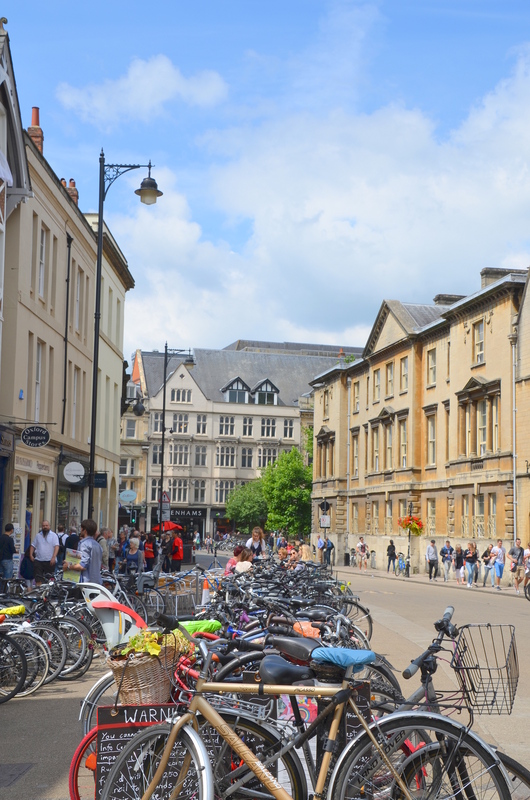 Oxford is a very bicycle friendly town and on our walk around town it seemed we were more in danger from being hit by a bike than a car. Because of the way this chap was dressed our tour guide said that he’d be sitting for exams. 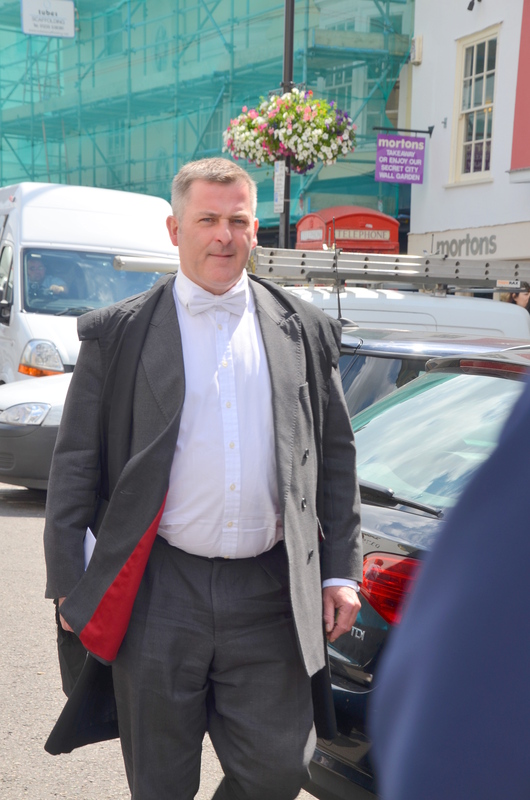 The white bow tie was significant as to what exams he’d be sitting for. There are dress codes that are still observed for taking exams and other ceremonies, too. 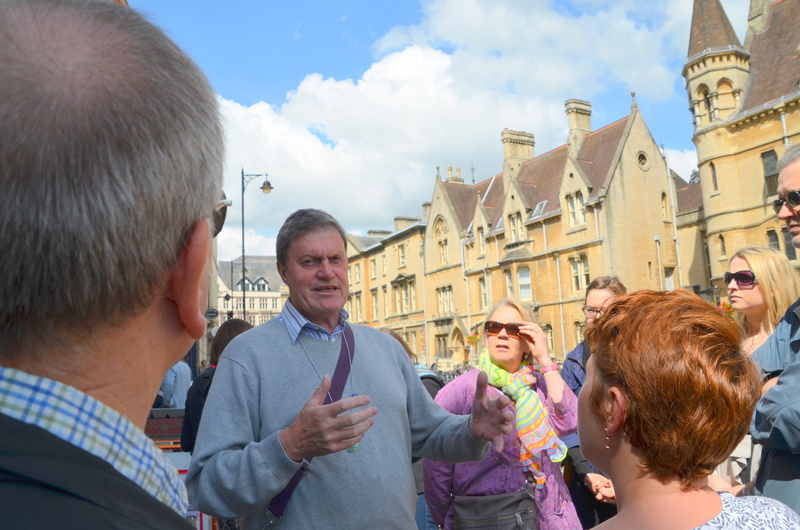 After Balliol our tour guide showed us some other major sites in Oxford that I will post about soon. 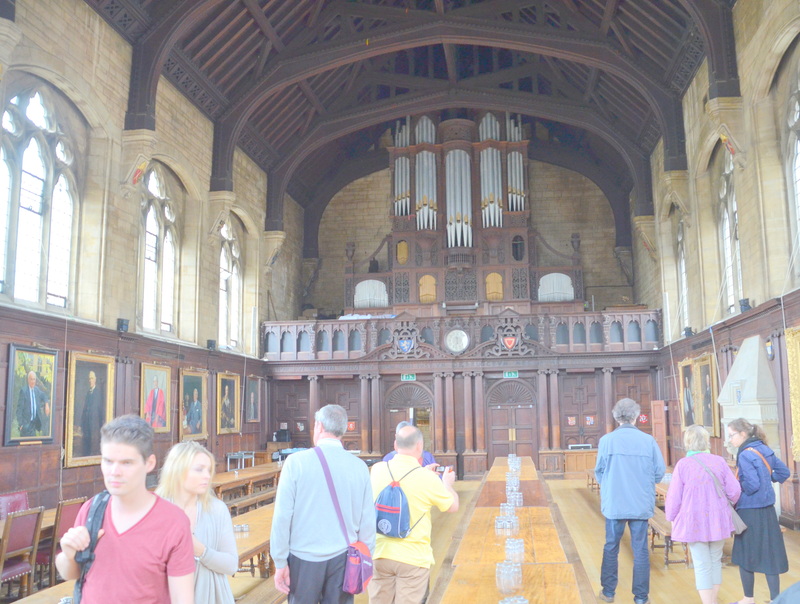 When our tour was over Dear and I spent some time at Trinity College and Magdalen College before we met up with a couple we met on the tour from Vancouver Island at the Oldest Pub in Oxford. It’s only Monday and it feels like Friday. We are having a very warm summer day in the Pacific Northwest. The thermometer is already registering over 80 degrees. We are in a dry hot spell this week. Work is continuing slowly in our bathroom. The tile guys are suppose to be here tomorrow. 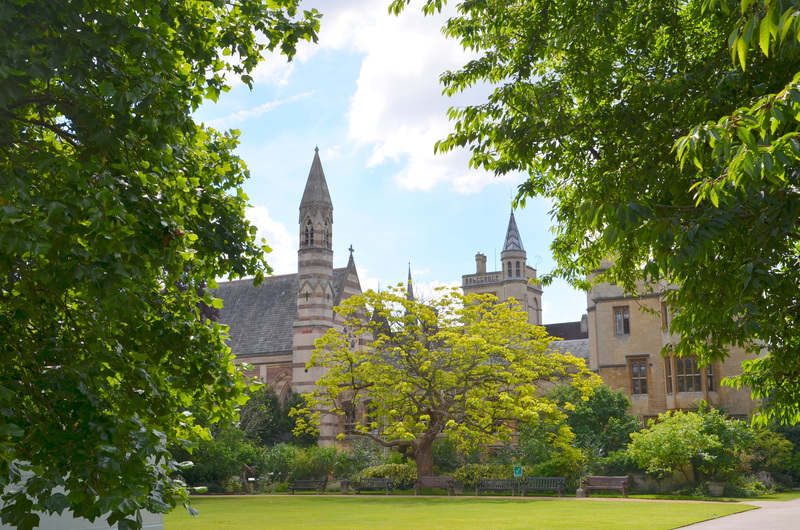 Posted on July 28, 2014 by Ellen •	This entry was posted in ABC Wednesday, England, Travel and tagged Balliol College Oxford, Bicycles in Oxford, Moreton in Marsh, Oxford, Oxford Colleges, Oxford England, Visitor Center Tours, Walking Tours in Oxford, William Butterfield, William Butterfield Chapel. Bookmark the permalink. You would not believe that your post triggered a memory that took me back to 1980! One just never knows what’ll happen visiting one’s blogging buddies. It is interesting all the strict dress codes. I sometimes think it’s a bit over the top, but on the other hand, it just makes Great Britain delightfully idiosyncratic. Such impressive, imposing structures!! And I had no idea that a student must “dress” to take an exam! So much to learn! Ha ha we got rain…guess it was typically yours? Feels great to be under 90 for a bit! I love the dining hall photos. I might not enjoy sitting at a bench for every meal but perhaps a bench would curb lingering over one’s meals long. New dieting tip? What I really want to know is what you meant by saying the other tours were “too hawkish for your taste”. UK academic suddenly going pro military? Jill, the other tour groups stood outside the visitors center/information center coming at us to try to get us to go on their tour instead of the visitor centers tours. They were on the attack and that really turns me off. 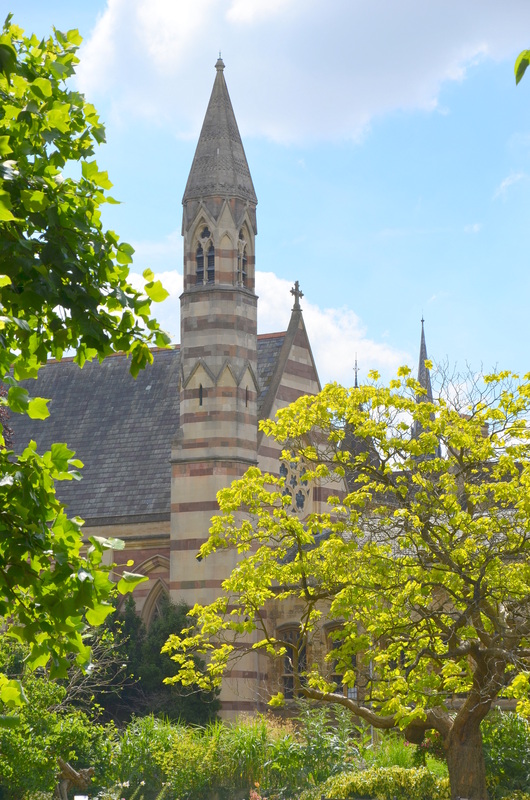 Isn’t Oxford amazing? I was there 2 years ago and a friend who lives just outside of the city gave me her own personal walking tour! What a treat! So glad you enjoyed yourselves. I love walking tours – it seems to give me a better orientation that way. What a beautiful college! 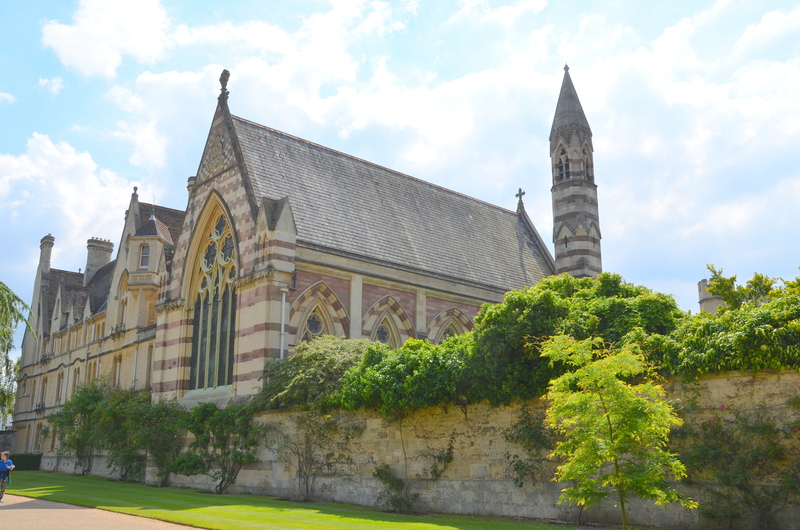 Beautiful buildings and your photos are a treat – I love reading stories set in Oxford and the various colleges. 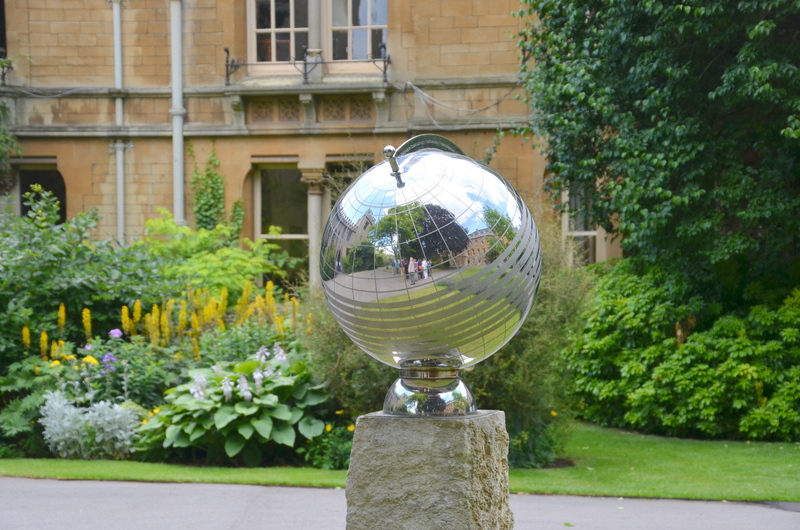 I enjoyed visiting Oxford through your blog this evening. It is so regal and full of history. I’m impressed the students wear bow ties when they take exams! wow! I just love the pomp and circumstance of it all!!!! There are so few institutions that still observe the highbrow niceties of days gone by, so it’s wonderful to see something like this!!! The white bow tie and fabulous suit are SUPER special!!! I just think one would be psychologically more prepared to concentrate and do well if “dressed for the part” so to speak. I wonder what the ladies wear? Hmmmm….I’ll have to look that up! The grounds are beautiful. What a wonderful environment in which to study and live! Thanks for the bit on dress codes and exams. I find that very nice and interesting. Your grandnephew is a cutie. 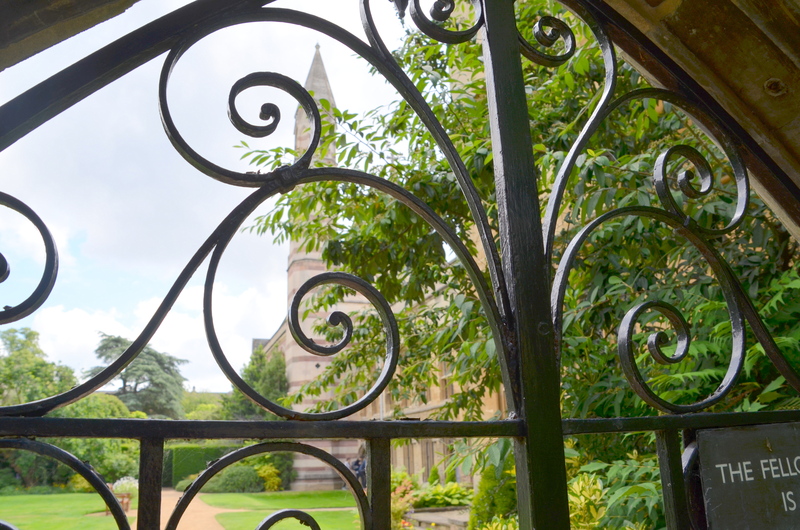 Thanks for the lovely virtual walk through Oxford! 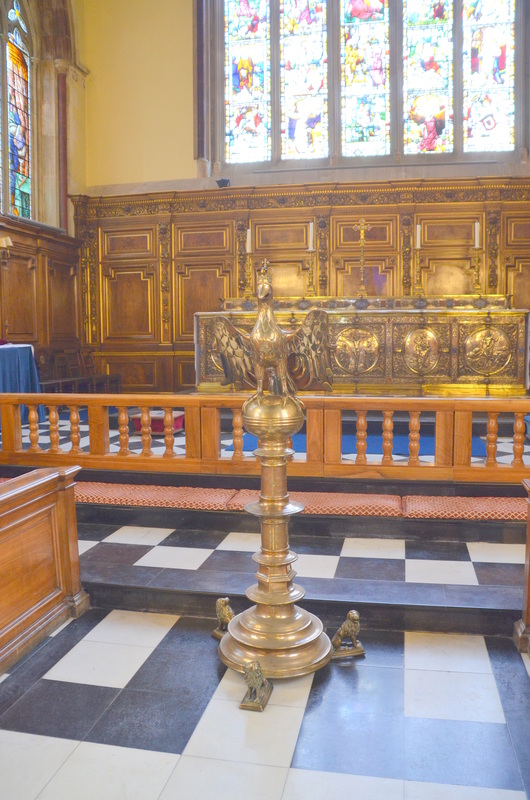 It does look the perfect place to study, always a treat to walk around beautiful buildings and I have done it today from the comfort of my chair thanks to you. The train is definitely the hassle free way to travel into a city.